Almost any soil with good drainage. Sow seeds directly in the bed or row, one-half inch deep and 1 inch apart. Thin to proper spacing when the seedlings are 1 week old. 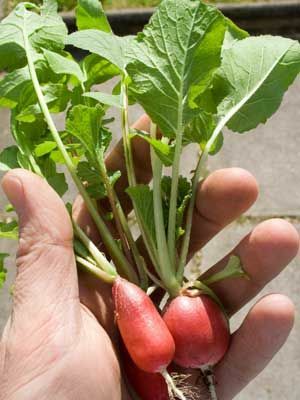 Use radishes to mark divisions between sowings of salad greens or other spring vegetables. Harvest round radishes when the roots are the size of a quarter. Young radishes have the best flavor, so pull them promptly. Flea beetles often make small holes in leaves, but do not merit control.